The booing section for Under Armour Inc(NYSE:UAA, NYSE:UA) remains a loud one with a loyal and bearish fan base. Nevertheless, off and on the price chart, UAA stock is looking good — and worthy of bulls’ suiting up with a longer-term vertical call spread. Let me explain. In the world of Cannacord Genuity’s Camilo Lyon, ‘Da bears are in fine shape and likely ready to launch a successful counter-attack on UAA stock investors, who are seeing conditions a bit differently with shares up 17% since early May’s mostly better-than-expected Q1 confessional. Following Under Armour’s report, the analyst wrote, “We see no reason to be constructive on UAA as the product creation/segmentation malaise has not improved, personnel issues/discord continue to surface, the competition landscape is intensifying, and valuation appears indefensible.” The firm went on to reiterate its sell rating and issue a $9 price target. 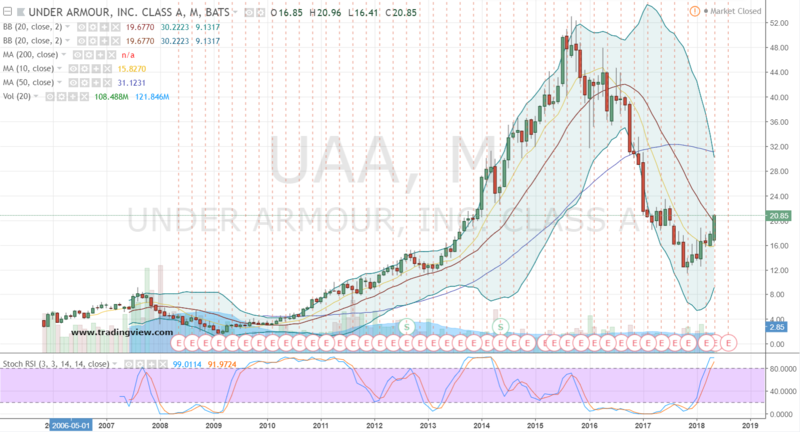 Ultimately, UAA stock remains a turnaround play. But the company is making the right moves overall as sales continue to improve, spearheaded by continued and promising international growth of more than 25%. Net, net, it’s this strategist’s view that using sports goggles to better read the playing conditions off and on the UAA stock chart would be advisable for Mr. Lyon. As noted, the booing section for UAA stock remains popular on Wall Street. Nevertheless, bullish investors have stolen the game back from the bears with a confirmed uptrend established in late March and early May’s earnings release reaffirming the much-improved price action. There’s little to suggest the newly minted trend won’t continue to improve for Under Armour shares in the weeks, months and years ahead. However, as I voiced in late April, I’m not expecting UAA stock to necessarily sprint higher as business growth and weaker margins still don’t support momentum-style returns. But as a turnaround play that is continues to show the right kind of moves off and on the price chart, I do like Under Armour. Our last proffered spread in front of earnings has generated a 278% return with profits of 78 cents thus far. There’s still plenty of time on the calendar and room to improve the vertical’s performance by roughly 500% if UAA stock can climb above $22.50 at July expiration. Reviewing UAA’s options for fresh positioning and given our bullish longer-term outlook, I like the idea of going deep with a further out and out-of-the-money call vertical. Specifically and with Under Armour shares at $20.85, the Jan $22.50/$30 call spread for $1.55 is a favored combination. Using this vertical allows the trader to drastically cut down Greek risks while limiting the position’s exposure to just over 7% of UAA stock. The max payout is $5.95 above $30 at expiration in January. 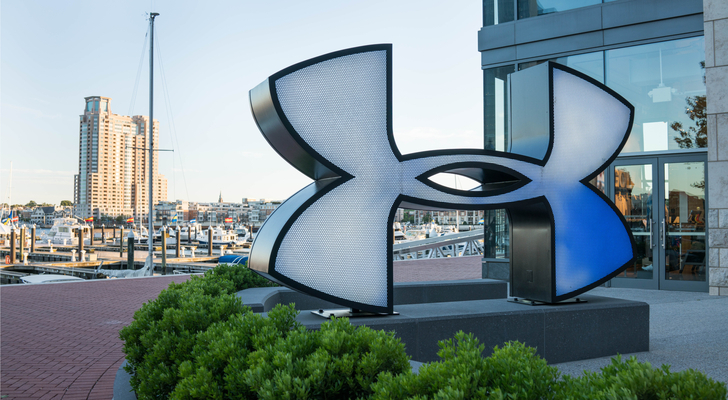 The spread does require a continuation of Under Armour’s price trend in order to profit — or for that matter, break even on an expiration basis. But if we’re correct and this is the start of a more meaningful run higher, the several months of playing time this spread offers should allow for plenty of opportunities to capitalize and successfully defend against ‘da bears. Investment accounts under Christopher Tyler’s management currently own positions in Under Armour (UAA) and its derivatives. The information offered is based upon Christopher Tyler’s observations and strictly intended for educational purposes only; the use of which is the responsibility of the individual. For additional market insights and related musings, follow Chris on Twitter @Options_CAT and StockTwits. Article printed from InvestorPlace Media, https://investorplace.com/2018/05/under-armour-corp-uaa-stock-game-over-for-bears/.